Don’t understand a word your friends from overseas are saying? Chances are you’ll immediately yank out your phone and swipe around for a translation app. But if you’re 21-year-old Illisha Ramachandran, you won’t settle for downloading a mere app. That’s just too easy. Instead, Ramachandran built her own translator—based on an Intel Edison chip, for less than $100, with code she learned to write. The Intel-sponsored Maker Faire Singapore drew more than 10,000 people, including Singapore’s Education Minister, Mr. Heng Swee Keat (2nd from right), who dropped by for a visit. 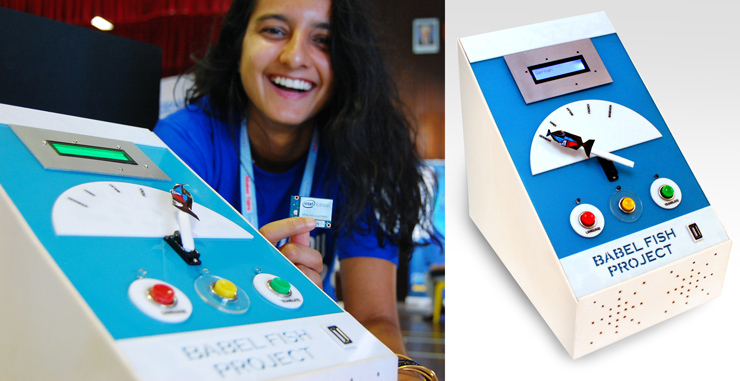 As part of Intel’s effort to encourage inventors and creators, our company has now donated more than 50,000 Intel Galileo “maker” boards worldwide. Ramachandran is just one of countless makers set on realizing their techie idea at a time. 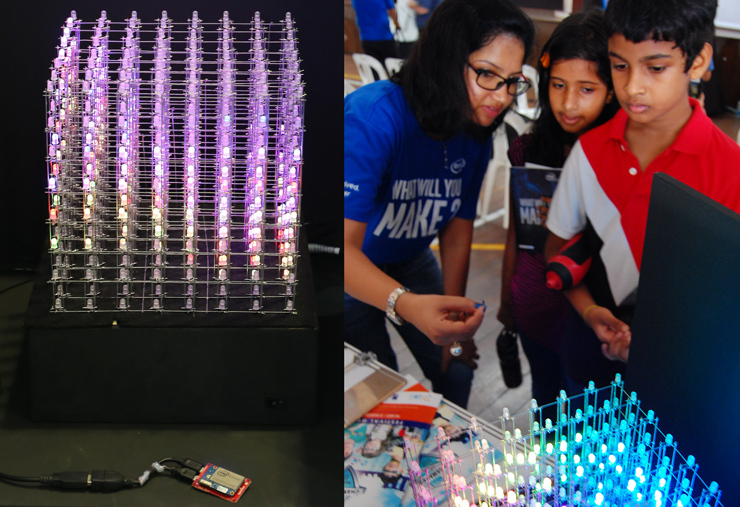 This month, she joined hundreds of other makers—including twenty from Intel—to show off their inventions at Maker Faire Singapore, the largest maker showcase ever held in South East Asia. This fourth annual event, sponsored by Intel, featured over 250 exhibits seen by well over 10,000 attendees. 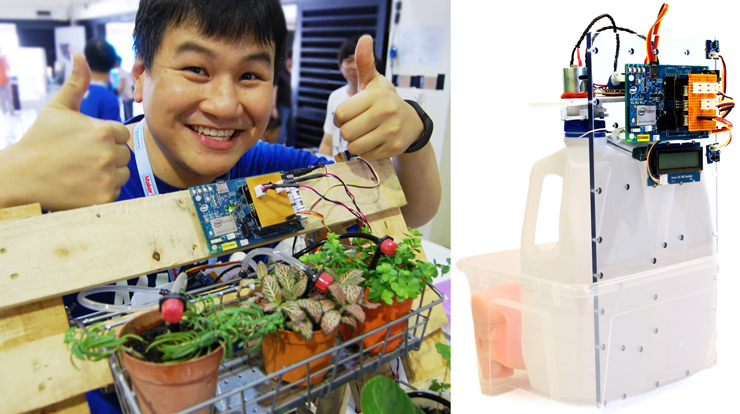 Bringing the Maker Faire to Singapore is just the start of a multi-year journey in this region, aimed at spurring innovation in the Internet of Things (IoT) and wearables. 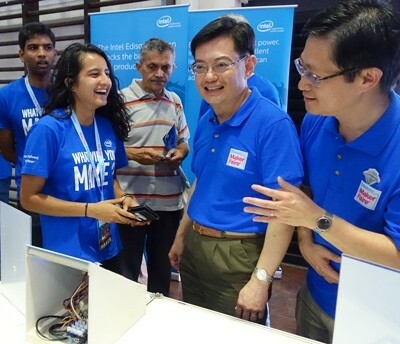 At the Faire, Intel also announced partnerships to establish Open Innovation Labs at Nanyang Technological University and Nanyang Polytechnic — two leading academic organizations in Singapore. On the global front, Intel has donated over 50,000 Galileo boards to 1,000 universities to date, all in an effort to promote innovation around Intel-based products. Below, check out the six most intriguing Intel-powered inventions spotted at this year’s Faire, plus meet the Intel team behind the show. 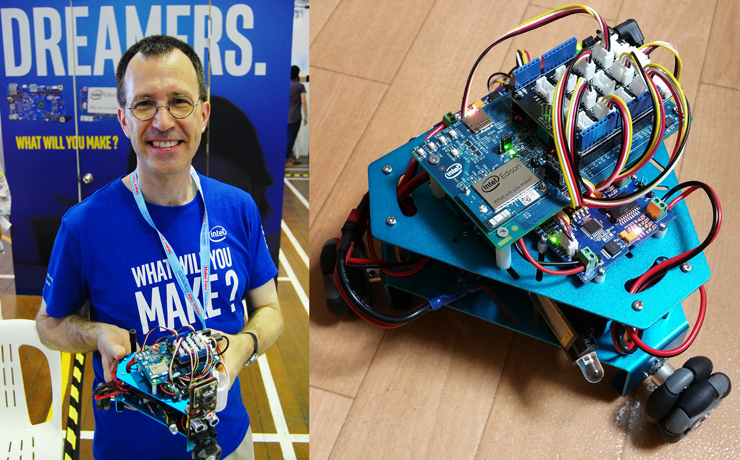 Smart homes are just an app away – meet Gabe II, a Edison-powered smart home automation device dreamed up by a cross-functional team of makers from Intel Malaysia. By outfitting a mock home with IoT sensors that drip-feed information back to the cloud, this team showed how virtually every device in the house – lights, A/C, kitchen gadgets – could be turned on or off from a cellphone or tablet. Their booth drew big crowds, with some even asking if they could buy the device (sorry to disappoint: it’s prototype-only, for now). Spiders may give you creepy crawlies, but judging from the huge crowds that inched in to view the Intel Hexapod “robot spiders,” probably not this one. Complete with six 3D-printed legs—first shown off at CES earlier this year—the hexapods dance in unison and respond to hand gestures. Here, Anuj Dua, who leads Intel’s marketing efforts in Asia Pacific and Japan, shows his two sons what the spiders are capable of doing. Dua is a budding Maker himself—at a press event held earlier, he shared how he built a simple hovercraft for his youngest son, cobbled together by nothing more than plastic sheets, duct tape, and a power tool. If you love cool robots, you’ve got to meet Dr. Mike McCool. A principal engineer from Intel Japan and former university professor, McCool joined Intel six years ago when Intel acquired his software venture RapidMind. His latest creation—the three-wheeled OmniRover—requires no soldering, just assembly through plain old nuts, bolts, and glue. It drives itself through laser range-finders and positional sensors, scurrying around a table to the delight of kids cramming in to watch. Why robots? Why not? McCool hopes his creation will inspire Japanese school kids to pick up programming. His next project: building a tougher, grittier OmniRover to compete in Japan’s famed robot tournaments.